As Mexico wrestles with what to do with more than 5,000 Central American migrants camped out at a sports complex in the border city of Tijuana, President-elect Andres Manuel Lopez Obrador's government signaled Tuesday that it would be willing to house the migrants on Mexican soil while they apply for asylum in the United States — a key demand of U.S. President Donald Trump. Mexico's new foreign minister also called on the Trump administration to contribute to development projects to help create jobs in Central America to stem the flow of migrants from the impoverished region, suggesting an appropriate figure would start at $20 billion. "We cannot determine at what pace people are interviewed" by U.S. officials as part of the asylum process, the incoming foreign relations secretary, Marcelo Ebrard, told a news conference in Mexico City. U.S. border inspectors are processing fewer than 100 asylum claims a day at Tijuana's main crossing to San Diego, creating a backlog of thousands. "So, what do we have to do?" Ebrard asked. "Prepare ourselves to assume that a good part of them are going to be in this area of Mexico for the coming months." "We have to support local authorities" in housing and feeding the migrants, he said, adding: "That is not a bilateral negotiation. That is something we have to do." Lopez Obrador, who won a crushing July 1 election victory and takes office on Saturday, built his political career on defending the poor. He now faces the difficult task of placating Trump on the migrant issue while upholding Mexico's longstanding position of demanding better treatment for migrants. Ebrard told reporters Tuesday a key administration goal is securing a U.S. commitment to development projects in Honduras, where the vast majority of the migrants in the caravan come from, as well as neighboring Guatemala, El Salvador and elsewhere in Central America. "What are we negotiating with the United States? We want them to participate in the project I just mentioned" to create jobs in Central America. Asked how much the U.S. should contribute, Ebrard suggested the figure should be at least $20 billion. "Mexico by itself is going to invest in our own territory during the next administration, more than $20 billion, and so any serious effort regarding our brothers in El Salvador, Honduras, Guatemala, should be for a similar amount," Ebrard said. 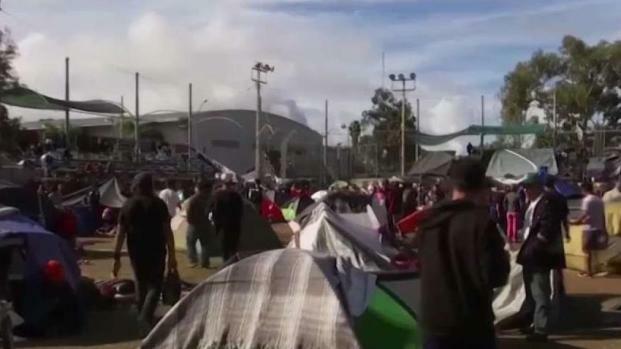 Ebrard's statements came as anxious Tijuana residents closed down a school next to a sports complex where thousands of migrants have been camped out for two weeks. The move came after U.S. border agents fired tear gas into Mexico to turn back a group of migrants who had breached the border over the weekend. The incident prompted Mexican authorities to step up the police presence around the shelter. Citing fears for their children's safety, the parents' association of the Gabriel Ramos Milan elementary school bought their own lock and chain and closed the school's gates. A sign said the school would remain closed until further notice. Carmen Rodriguez said parents had been calling for authorities to do something since the migrants arrived, adding that her 9-year-old daughter wouldn't be returning to classes until they are gone. "We are asking that they be relocated," Rodriguez said, noting that some migrants had approached the school grounds to ask children for money and use the school's bathrooms. Some even smoked marijuana around its perimeter walls, she said. She said the parents worry about anti-migrant protesters converging on the sports complex again, as they did last week. "If they come here and there is a confrontation, we will be caught in the middle," she said. The migrants themselves were urgently exploring their options amid a growing feeling that they had little hope of making successful asylum bids in the United States or of crossing the border illegally. Most were dispirited after the U.S. agents fired tear gas on the group of migrants trying to cross into the U.S. on Sunday. They saw the clash and official response as hurting their chances of reaching the U.S. Mexico's National Migration Institute reported that 98 migrants were being deported after trying to breach the U.S. border. 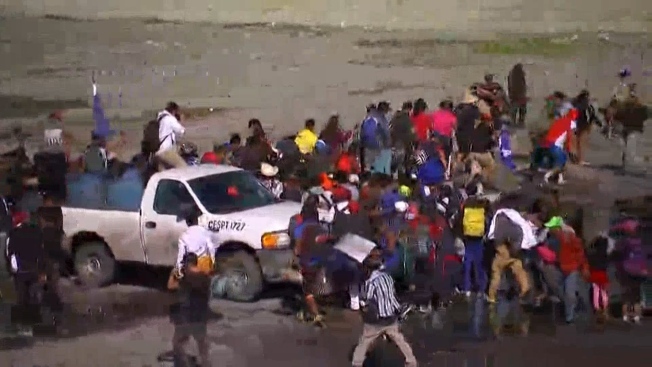 The country's Interior Department said about 500 people attempted to rush the border, while U.S. authorities put the number at 1,000. There was a steady line Tuesday outside a tent housing the International Organization for Migration, where officials were offering assistance to those who wanted to return to their home countries. Officials also reported more interest from migrants wanting to start the process of staying in Mexico. A job fair matching migrants with openings in Baja California saw a growing number of inquiries. "What happened yesterday harms all of us," Oscar Leonel Mina, a 22-year-old father from San Salvador, said of Sunday's border clash. Mina, his wife and their toddler daughter avoided the protest and were glad they did after hearing others recount what unfolded, he said. There "you can earn money and live well" if you're willing to work, he said. He set a goal of trying to move his family out of the sports stadium in another week. Mexican security forces stepped up their presence at the sports complex, apparently seeking to avoid a repeat of Sunday's ugly scene. Tijuana public safety secretary Marco Antonio Sotomayor Amezcua told a news conference that Mexican police would be prudent in their use of force, but "we have to guard at all cost that the border posts are not closed again."